My brother-in-law, inspired by my previous goofy attempts at making wine out of mint and other things around the house, decided to make his own batch. He's got plenty of mint growing crazy in his yard, so after collecting a bunch, he got himself a healthy batch of country wine. Not to be outdone, I decided to get my own batch started up. I had an old can of frozen juice that's been sitting in the freezer for too long. 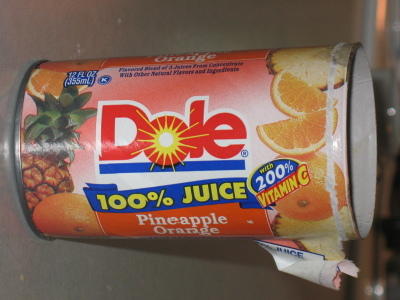 Pineapple orange. Yum. I found this great jug at a garage sale for $3. Looks like a booze-making jug. After mixing the can with a pitcher of water, and throwing in about a cup of sugar and a packet of yeast, I let the jug sit lightly covered in my pantry. This morning, there was a healthy level of foam on top -- looks like the yeast is enjoying the sugar bath. In about two weeks, this should turn into something delicious. This is so much harder than it looks. You have no idea. Or maybe I'm just clumsy or something. is that a 4L like calebs, cause thats what i have too. 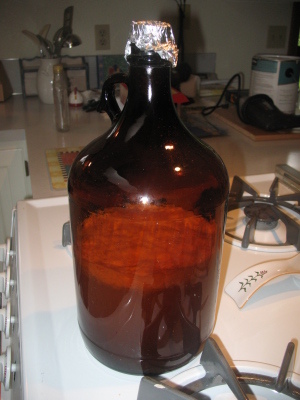 im going to start my fresh nectarine wine as soon as i can get some yeast and an airlock. Max - I've done this a few times in the past. It's pretty easy if you're using frozen juice. Doing it from fresh fruit is a little more tricky, because you have to break down the fruit in a way the yeast can access it. Cam - if you need ingredients, I'll be glad to pick some up and send them your way. Let me know. well, i bought a 6 bags of yeast off ebay for 5 bucks. and i can get a s-airlock off ebay too, i just cant find a bung. I cant wait to see how yours turns out. 30 days seems like it takes forever. If I can do it faster that would be cool. I have made my batch of cherry wine. I have plenty to make another cherry wine with a different recipie. I think that when you start with frozen juice, you only have to wait two weeks. 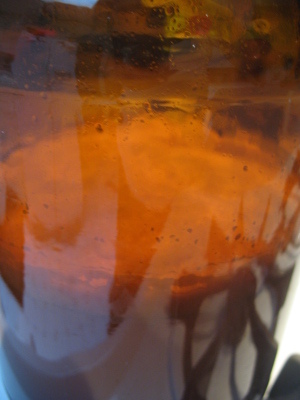 The yeast doesn't have to spend any time breaking down the fruit fibers and such. Insect714 - interesting. Thanks for the information. Incidentally, I prefer sweeter wines... but having a higher proof is useful as well. Perhaps a combination would be good.